Keranil cream is keratolytic agent (skin exfoliant). It reduces hyperkeratosis, fissures, pain and making skin smooth & healthy. It is highly effective crack repairer. 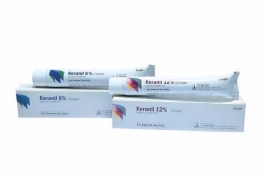 Keranil 6% & 12% cream is available as 30 gm lamitube. Ketof is a preparation of Ketotifen which is indicated for the Prophylactic management or treatment of bronchial asthma and symptomatic treatment of allergic conditions including rhinitis and conjunctivitis. 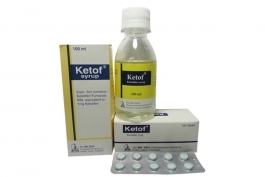 Ketof is available as 1mg Tablet and 100ml Syrup. Ketotab is a preparation of Ketoconazole USP .It is an antifungal drugs,indicated for Vaginal Candidiasis, Pityriasisversicolor, Perionyxis, Onychomycosis, Oral thrush and other fungal infection. It is available as 200 mg Tablet.